CALIPSO produces Level 1 and Level 2 science data products that are listed in detail in the CALIPSO Data Products Catalog (PC SCI 503). These products are archived and distributed by the Atmospheric Science Data Center (ASDC). 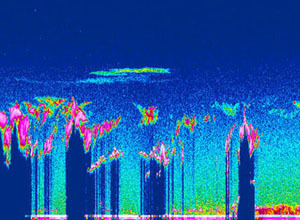 Image above: An example of data collected by CALIPSO's lidar in June 2006. The data extends from sea level to 30 km. Table 1 gives a summary of the CALIPSO Level 2 data products and the spatial scales at which the data products are reported. The expected accuracies given are for the maximum averaging distances for which the products will be retrieved. Cloud products are reported at a horizontal resolution of 5 km; i.e., at the fundamental averaging resolution of the processing scheme. Cloud boundaries, which can be detected at higher resolution, are reported at that resolution. To account for weaker backscatter signals from aerosols, the Level 2 aerosol profile products are reported at a uniform horizontal resolution of 40 km at all altitudes. Note: * assumes 30% uncertainty in the aerosol extinction-to-backscatter lidar ratio, Sa.